“And Zechariah said to the angel, 'How shall I know this? For I am an old man, and my wife is advanced in years.' And the angel answered him, 'I am Gabriel. I stand in the presence of God, and I was sent to speak to you and to bring you this good news. And behold, you will be silent and unable to speak until the day that these things take place, because you did not believe my words, which will be fulfilled in their time'” (Luke 1:18–20, ESV). Zechariah was old and without children. Gone were the days when he and Elizabeth would dream of how many children they would have. As a priest, he would have administered many offerings for families after the birth of their firstborn. Doubtless, he brought many offerings before the Lord pleading for Elizabeth's womb to be opened. Elizabeth's tears would fill too many bottles. Their priestly lineage had no progeny. They would have felt unfruitful and the inability to generate in the presence of the God of generations (the God of Abraham, Isaac and Jacob) would have felt like cold, hard steel thrust into their soul. Hope for children would have been abandoned. Maybe at this point Zechariah thought, "God is good to others but not to Elizabeth and me." But the Lord had ordained something that Zechariah couldn't see. As he was fulfilling his priestly duty, the Lord sent His angel Gabriel to Zechariah. God is still at work long after we have given up hope. But when Zechariah heard that his aged wife would be like Sarah, bearing a son in her old age, he doubted. Maybe there had been too many false hopes. The voices of too many well meaning friends and family made too many promises of what God would do for them, which came to naught. So, when the angel appeared, Zechariah was reluctant to believe. "Realism" (or cynicism) had set in, "My wife and I are too old. Prove it!" Zechariah was afraid of an empty promise. He knew the proverb well that reads, "Hope deferred sickens the heart." It is easy to find ourselves discouraged because of unchanging circumstances. While the circumstances are unchanging, sometimes we can find ourselves changing, not for the better, but for the worse. But God is a God who works by grace. He doesn't require perfect faith from Zechariah to fulfill His purposes. Gabriel reframed Zechariah's perspective. God fulfilled His purposes in His time, not our time. By not having what every other Jewish couple had at this stage in life, Zechariah wasn't missing out. God had a greater purpose. We far too easily settle for the status quo, but God was working something greater. Zechariah was going to discover that some of God's greatest blessings are born in our sufferings. Thus, God sends the blessing of good news to Zechariah. The word used for good news in verse 19 is the word for gospel (euangelion). This dry tree would become fruitful (Isaiah 56:3-5). 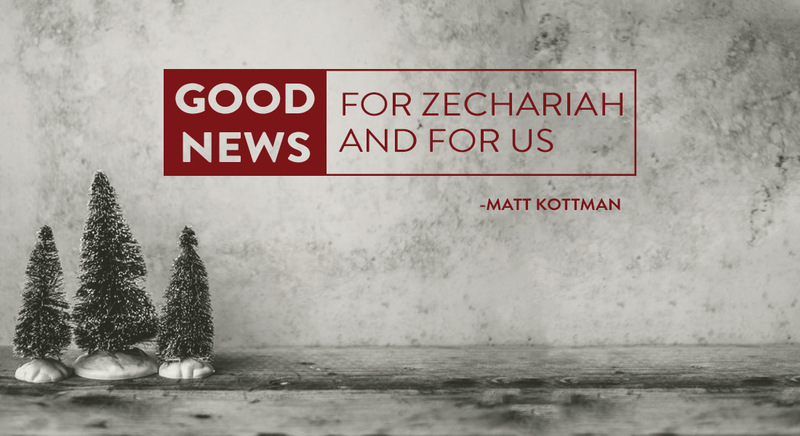 Although the promise of good news was given, Zechariah couldn't see how he could have the strength to bring it about. But therein lies the beauty of good news. The good news is good because it doesn't depend on human ability. If it was dependent on his ability, he was already well beyond good news. The gospel is the good news about what God does in spite of our weakness, not what we do in our strength. As a result of Zechariah's lack of faith, God graciously gives him space to meditate in silence. He was furnished with an opportunity to be still and know that the Lord is God (Psalm 46:10). This good news had to become real in his heart, before it could ever be real in his words, for the gospel is a message of changed hearts before it inhabits our words. But that word would go forth with power through this good news, for Zechariah's son would become the voice who would proclaim the message of the Word made flesh. May this Christmas be one where all of our struggles, fears and discouragements give place for a God who makes all things beautiful in His time. He is a God who is at work, even in the dead silence of struggles. Trust Him that His good news is good because it is not dependent on your ability, but upon His own promise.